Have you been working on your book and completed a first draft? No matter how rough? Do you want to take your book all the way to becoming a published author? A first draft is the end of the first step. This is a unique once-a-year opportunity to work with this top coaching team to get your book polished, ready and submitted to publishers. What happens on this Bootcamp? This is a pretty intense 10-week process that really breaks the process down and supports (and pushes) you to move forward. It is a chance to edit, get feedback, write your proposal, get your marketing material ready and get your brand collateral ready. You will end up submitting to publishers. We work with writers all over the world and often find that writers stall on this critical step. Because we are both SUPER STRICT, and we want to see your book get out into the world, we are prepared to push you all the way... with some expert guidance. It also pushes you to understand your author brand and to start to build it with guided support. 1. It has fixed timelines, tasks and deadlines to take you up to submission. 2. We have three live group calls with targeted, clear lessons on what to do next and HOW to do it. 3. You get the focused support of top coaches Kate and Sarah to keep you accountable and ensure you meet your deadlines. You know you love us and even if we push you! 4. Colleagues who review and feedback on your book proposal / synopsis and first chapters. 6. Understand and start building your author brand and social media. 7. 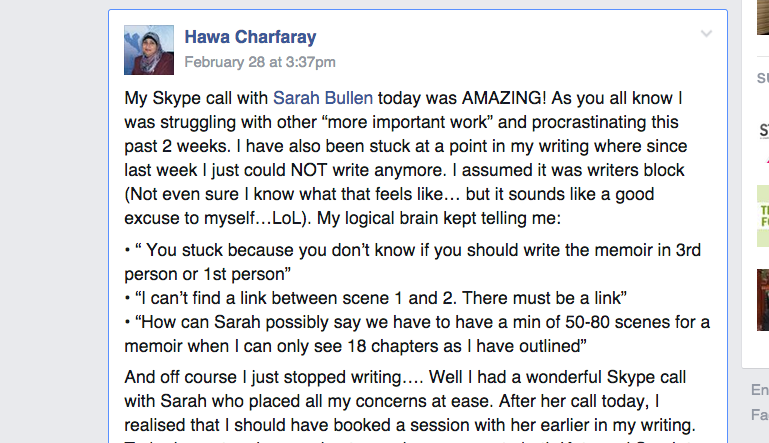 You are part of closed FB group of writers, all working towards a common goal. You start together and end together and will get support from other these writers in differing stages of this journey. 8. A non-negotiable partner and second (beta) reader. 9. Tracked status updates to ensure your progress - the all-important ACCOUNTABILITY! 10 Access to a network of editors, proofreaders and professionals for your completed work. 11. You will learn about different publishing options, explore costs and distribution models for your book so you are clear on where to send it. 12. A database of publishers and agents. * You have a completed first draft of your book - no matter how rough. * You are about 60-80% through your first draft of your book and can honestly complete it by the start of the course. * This is open for writers of novels, memoir, non-fiction, e-course manuals. Starting your writing journey? If you have not yet written your first draft you will want to rather join our Complete your Book Mentorship which takes you from your dream to a first draft. To what extent do Kate and Sarah read my work and edit or give feedback on it? Each writer gets one 45 min session with each Kate and Sarah. Sarah's session includes 45 mins of reading time. I like to do these sessions closer to the end when you have your entire 'pitch deck' ready so I can get hands-on and stuck into the final changes to make this grab a publisher or agent. This is the thing that will get your book SOLD so I work with you to get this angle right for the final submissions. Can Sarah edit my book? This is not included in this bootcamp. Sarah does take on books to edit on an application basis, but that can be quoted separately. Can Sarah take on my book as agent? This is not part of the mentorship. Submissions to her as agent will happen separately and independently of this course. That said, Sarah does take on many of the books in the genres she represents - romance, non-fiction, biography and memoir. What if I don't think it's ready? We would like you to finish and will do our very best to make sure you do. We have lots of resources to get you there. * Editing or other professional fees. I have worked with writers internationally for over 15 years to get their book written, and published. After many years of teaching writing I have found this magical online course has changed my entire view of the process. I have always advocated writing alone but the group dynamic of these courses takes on a life of its own. It has been a breakout success and the constant push towards the finish has kept writers going. 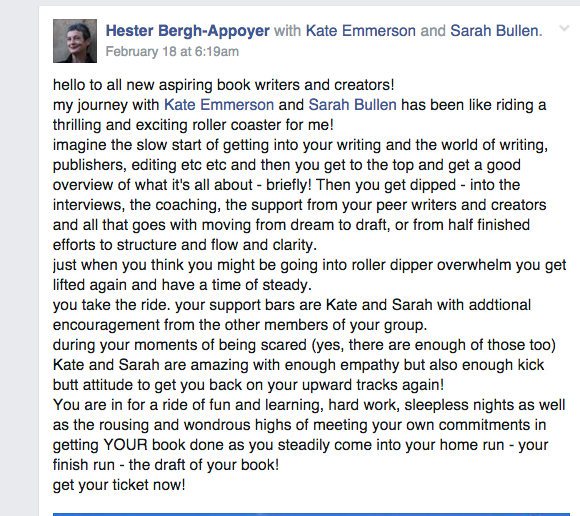 The support is incredible and writers who are clear they want to write a book will get there on this course. Added to that they get my structure and step-by-step process on how to plot, plan and write a book"
“When I wrote my first book, I literally had a green light from my publisher from a 2 page proposal that I submitted, and had zero input from specialists of any kind - just a deadline to hand it in. I literally sat and wrote on my own, but I am naturally massively disciplined and can simply trust my own process when I have big deadlines, plus I have the personal skills to overcome any negative self-talk that gets in the way of most writers. Writing my second book was a whole lot harder! I know this process is not that easy for most of you. My role is to keep you on track and to get your book out of you! I am very firm.. but kind." I have just completed the 10-week mentoring group with Kate Emmerson and Sarah Bullen and would like to thank Kate, Sarah and all the group members for their inspiration and amazing support! In the 10 weeks I went from starting to edit my first draft of my novel, to completion of the manuscript, with a Facebook page and new website created along the way to share me and my ideas with the world. So very exciting. I ended the 10 weeks with submission of my book proposal to nine publishers, and..... had the most thrilling news last week.... one of the first publishers I submitted to asked me to send my complete manuscript for further consideration!!! THANK YOU All the Way group! The completion of my novel, even without being published (yet :)) is the fullfillment of a lifelong dream. I would have to say this is life changing. My entire book-writing journey with these two ladies has been amazing. This just pushes you to get finished. It really is seeing you all the way to the submitting of a proposal to possible publishers stage. Their guidance, encouragement and positive/constructive feedback is wonderful and the support of the whole group is uplifting & motivational. Enjoyed every minute. We wanted to share some of our recent writers publishing success stories! I have just completed the All the Way 10 week mentoring group with Kate Emmerson and Sarah Bullen and would like to thank Kate, Sarah and all the group members for their inspiration and amazing support! In the 10 weeks I went from starting to edit my first draft of my novel, to completion of the manuscript, with a Facebook page and new website created along the way to share me and my ideas with the world. So very exciting. I ended the 10 weeks with submission of my book proposal to nine publishers, and..... had the most thrilling news last week.... one of the first publishers I submitted to asked me to send my complete manuscript for further consideration!!! THANK YOU All the Way group! The completion of my novel, even without being published (yet :)) is the fulfilment of a lifelong dream. I would have to say ALL THE WAY is life changing. My entire book writing journey with these two ladies has been amazing. The All The Way just pushes you to get finished. It really is seeing you all the way to the submitting of a proposal to possible publishers stage. Their guidance, encouragement and positive/constructive feedback is wonderful and the support of the whole group is uplifting & motivational. Enjoyed every minute. Sometimes the story you have to share is one you don’t want to face yourself, but you have taken your life journey for a reason- to experience the challenges and the pain yourself, in order to be able to truly share with others from a place of understanding, and to give them hope. I never knew how to share my story, and then like a divine gift from the universe, came Kate, Sarah and their army of expert teachers. From book structure and editing to publishing, branding and PR, I had no idea how hard it would be to write a book and what the whole process entails, but with Kate’s insight and guidance I did it! And if I can, you can. What an incredible experience – let them show you how. It’s a life-changing journey.